1.What is the flu vaccine? The flu vaccine protects against the three or four strains of flu virus that research indicates will be the most common during the upcoming flu season. Most vaccines are administered via a shot while another is administered intranasally. 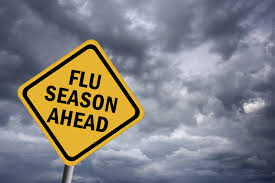 The “flu season” can begin as early as October and continue through as long as May. Typically, the peak in flu season occurs after December. 3. What types of flu vaccines are available? There are several flu vaccines available for the 2014-2015 flu season. Trivalent flu vaccines protect against three strains of flu viruses, two influenza A viruses (H1N1 and H3N2) and an influenza B virus. Standard dose trivalent shots are manufactured using virus grown in eggs. These vaccines are approved for use in ages 6 months and up. An intradermal trivalent shot uses a much smaller needle compared to the standard vaccine. The intradermal vaccine is approved for use in ages 18 to 64 years old. A high dose trivalent shot is approved for use in ages 65 and older. A recombinant trivalent shot, which is egg free, is approved for use in ages 18 to 49 years old. The quadrivalent flu vaccine contains the same influenza A and B strains and also an additional influenza B strain. A standard dose quadrivalent shot is available that is injected into the muscle, usually the arm. A quadrivalent nasal spray is approved for use in ages 2 to 49 years old. 4.Who should get vaccinated this season? Everyone 6 months of age and older should receive a flu vaccine. Vaccination is particularly important for people who are at high risk of complications from the flu, such as children younger than 2 years old, adults 65 years of age and older, and pregnant women. 5.How does the flu vaccine work? The flu vaccine exposes your body to a very small amount the virus to help your body create antibodies. The antibodies prepare your body to fight the flu when you are exposed to any of the strains later on during flu season. 6. When should I get vaccinated? Vaccination should begin as soon after the vaccine becomes available. The flu vaccine is typically available as early as late July or early August (depending on the manufacturer) and will continue to be available throughout the flu season. The earlier you get your flu vaccine the better, so you are protected throughout the entire flu season. 7.Does the flu vaccine work right away? It takes two weeks for the antibodies to develop and the body to provide full protection against the virus. This is why it is best to get vaccinated prior to the start of “flu season” so you are fully protected. 8.What are the common side effects from the flu vaccine? Based on the formulation, the side effects can differ. 9.What are the risks from getting a flu shot? The risk of a flu shot causing serious harm or death is extremely small. However, like any medicine, can cause severe allergic reactions. Almost all people who get the flu shot have no serious problems from the vaccine. 1. Why should I get vaccinated every year? The body’s immune response declines over time, so a yearly vaccination is important for the best protection. The vaccine is updated every year to keep up with the changing flu strains; therefore, receiving a vaccination every year is important to be protected against the season’s flu strains. 2. Can I get the flu even though I received the flu vaccine this year? Yes. There is still a possibility you can get the flu even though you got vaccinated. The flu vaccine protects against the most common flu strains; however, there are many strains of the flu. Even if the strains do not “match” those included in the year’s vaccine, receiving the vaccination can still help your body fight off the flu. Also since is takes two weeks after receiving the vaccine to develop protection against the flu, if you were already exposed to the virus before receiving your vaccination, you can still get the flu. No. The flu vaccine cannot cause the flu illness. The available vaccines are made in different ways. The vaccines that are administered with a needle are either made with inactive viruses or do not contain the viruses at all (recombinant flu vaccine). The nasal spray contains weakened (attenuated) live viruses, which cannot cause the flu. 4. How effective is the flu vaccine? How well the flu vaccine works can vary from season to season. The effectiveness also depends on who is being vaccinated. Recent studies have shown that the flu vaccine benefits public heath and reduces hospitalizations due to the flu. 5. Where can I find more information about the flu vaccine? The Centers for Disease Control and Prevention (CDC) provides excellent information about the flu and the flu vaccine. For more information, visit: http://www.cdc.gov/flu/about/disease/index.htm. What you Should Know for the 2014-2015 Influenza Season, Centers for Disease Control and Prevention;. Web site. http://www.cdc.gov/flu/about/season/flu-season-2014-2015.htm. Updated September 16, 2014; Accessed September 28,2014. The Fourth AmeriCorps Member Introduction!